In Bottle: Fresh and rosy and really pretty. Lady Vengeance is a young, bright, happy smelling rose scent that puts a smile on my face the instant I smell it. Applied: Feminine and clean and speaks to the springtime. I had wholly expected Lady Vengeance to contain a note of darkness, of depth and dense rosiness but she’s a bright and happy character instead. A bit funny for the name but I can’t stay mad at something this peppy. Lady Vengeance starts off with a brilliantly bright and new bloomed rose. It reminds me of a freshly watered rose bush glistening with dew on a brand new spring day. It’s like soft rose soap cut with real petals. There’s a powderiness to Lady Vengeance but there’s very little of it and it works so well in this fragrance that you just end up smelling like a really good rose powder. There’s a slightly sweet and gentle hint of vanilla but it is predominantly a very well done rose. This is a sweetened rose, not a sugar rose–I might add. The latter is the staple of modern rose-based scents that rely on sugaring up the note. Lady Vengeance has excellent longevity, it clung to me all day and lent that gorgeous clean rose for hours and hours until the dry down approached where the powderiness gives way and I smell a couple of whiffs of smooth patchouli under all the awesome rose soap. Extra: Juliette Has a Gun is a niche perfume line inspired by Shakespeare. It has ties to Nina Ricci. Mainly, the line was founded by Ricci’s grandson. Design: Set in a very cute black bottle, Lady Vengeance’s packaging would hint at a dark rose. But there’s no darkness in this as far as I’m concerned. The bottle has lovely little etchings in it that conjure up images of tattoos and goths. Notes: Italian rose, vanilla, patchouli. Reviewed in This Post: Lady Vengeance, 2009, Eau de Parfum. 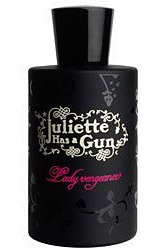 This entry was posted in juliette has a gun, Reviews By House, soliflore and tagged clean, juliette, juliette has a gun, lady vengeance, patchouli, powder, rose, shakespeare, soapy, vanilla. Bookmark the permalink.